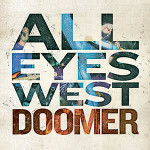 All Eyes West has announced details for their sophomore full length. The twelve song disc will be titled Doomer and is due out January 27, 2015 via Jump Start Records with a vinyl release slated for March. The band released a split 7#8243; with Easy Creatures in March 2014. To celebrate, the band is streaming the brand new tune, #8220;Lie In Wait,#8221; which can be heard below.